After a long journey from JFK in New York, to Miami, Florida, and then to Guayaquil, Ecuador – we had finally arrived to our port of departure: San Cristobal. In total we were eleven divers of the Cousteau Divers Expedition, led by Pierre-Yves Cousteau, the youngest son of Jacques Cousteau. 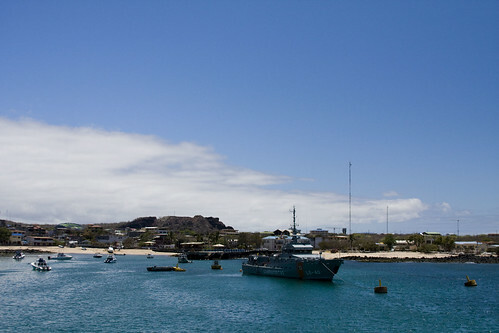 We would be departing for an eight-day voyage on sea to discover the wonders of the Galápagos Islands. The first underwater encounter occurred just minutes from San Cristobal on the Isla Lobos, a popular hangout for sea lions. 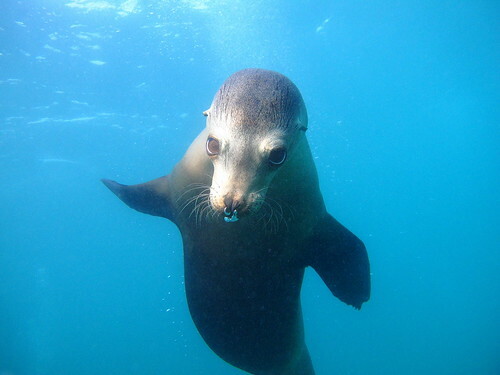 Although it was just a short dive to test our diving abilities, we were accompanied by an overtly friendly sea lion. Like a pet dog, the sea lion playfully swam through our group, contorting its body in unimaginable ways and blowing bubbles at us. Another sea lion soon joined and together, humans and animals, we tumbled through the waters. Their behavior was so canine, so domestic, it was not hard to see how sea lions share the same genetic roots as domestic canines. Afterwards, we returned to port to explore the local shops. 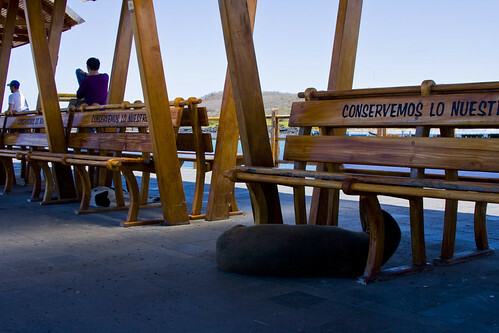 It was hard to tell if the town was run by people or by sea lions, as the creatures slept on benches, blocked paths, and covered the beaches. Rather than react aggressively to the curious bystander, they seemed happy to pose and show off for the cameras, although a few recently awoken sea lions seemed less than amused by “intruders”. This brief introduction to the immense biodiversity that awaited us in the Galapagos National Park motivated our team for the upcoming journey. Looks like a great start to your Southern Hemisphere adventure. Good luck, and I look forward to the vicarious experience through these post, so keep them coming when you have the time! Thanks for reading! I forgot to mention in the post – these are from a Southern adventure last October. I finally found some time to start posting them. Stay tuned – once this series is posted, I’ll start posting about life in Patagonia. Hope all is well (and not too inundated) there!